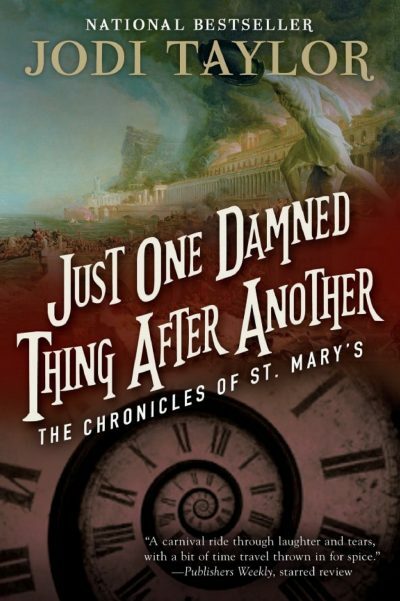 2013’s Just One Damned Thing After Another is the first volume in Jodi Taylor’s The Chronicles of St Mary’s. Academic achievement offered teenaged Madelaine Maxwell an escape from her horrific homelife. Her credentials as a historian prompted an offer of something even better: time travel. She is taken on at St. Mary’s, an institute dedicated to historical research via time travel (and contemporary experiment, often with dire and/or amusing results). She feels at home immediately. “We finished with a tour of the grounds, which were very pleasant if you discounted the odd scorch mark on the grass and the blue swans. Even as I opened my mouth to ask, there was a small bang from the second floor and the windows rattled. ‘That’s good, isn’t it?’ I said. St. Mary’s has attracted a stellar array of brilliant misfits, fluent in dead languages, intrepid and dedicated. Dedicated enough to risk their lives in past times, where they might be eaten by dinosaurs, killed in battle, or just die of bubonic plague. This is not just happenstance. History takes a dim view of people who might want to alter it. If it seems that a time-travelling historian might change the past, the past strikes back. With dinosaurs, armies, pathogens, etc. It turns out that there are dangers other than history out there. Human dangers. Just as people in zombie apocalypses seem never to have seen a zombie apocalypse movie, so people in novels about the pioneering days of time travel never seem to have read novels on the subject1. The upside for readers: we get to watch the characters discover for themselves what not to do. For example, travelling back in time into circumstances that allow an angry Hussar can stab you? That’s a no-no. And it’s probably best not to hand-feed the velociraptors. The obvious comparison here is to Connie Willis’ Time Travel series (Firewatch, Doomsday Book, To Say Nothing of the Dog, Black Out and All Clear.) The comparison is for the most part in Taylor’s favour. One Damned Thing includes no peculiar anachronisms (someone using a rail-line decades before it was built) nor any plot lines that could have been rendered nugatory had any two people simply talked to each other2. Taylor’s Britain isn’t based on a cursory misreading of P. G. Wodehouse. Plus, while One Damned Thing is clearly intended to be the first in a series, it still stands on its own. This was a lot more upbeat than I expected from “time travellers discover the hard way how many things will kill humans.” In fact, it was hilariously funny. Fast moving too. [Editor’s note: I stayed up to 1 AM finishing this book, because I could not stop reading. And laughing.] Two thumbs up. Just One Damned Thing After Another is available here (Amazon) and here (Chapters-Indigo). 1: I don’t think any of the St Mary’s time travellers have worked out that one doesn’t need to delve into burning libraries to salvage books if one can be satisfied with photographs of lost texts. But St. Mary’s has a small staff. It may be inventive, but it is bound to overlook some obvious notions. Something we discovered in a role-playing game, decades ago: if you are the first people to travel through time, that means every other time traveller you encounter knows most about time travel than you do. This isn’t always good, particularly when you consider that the early days of time travel are likely to be the sort of historically significant event future people will want to study in depth. 2: People keep secrets in this book, but the secrets are consequential, not at all like Willis’ Threes-Company-style miscommunications. Just read this book based on your recommendation. Put the next two on hold at the library immediately after finishing it. Seconding Larry's comment -- just finished Taylor's book based on your review, loved every bit of it, and have ordered the next. I'm delighted to see how many are in the series!